Never Ending Songs Vol. 1 by The Bed Band! The Bed Band’s fourth album of 2018, and the longest album ever by The Bed Band with an overwhelming 20 songs. Take a journey through some of The Bed Band’s most compelling songs, from ragers to heartbreakers, lonely homemade bedroom songs made just for fun. Click on the album cover above to listen to the album! Country Classics! The Bed Bands dark and mellow take on songs that are inspired by the countryside, country music, and country lovin! Twangy guitar lines, honky tonk pianos, hobblin bass lines, and the occasional spaced out synthesizer makes Country Classics a special part of Bed Band history. Enjoy these homemade marvels of songs lost in time! Click on the album cover above to listen to the album! 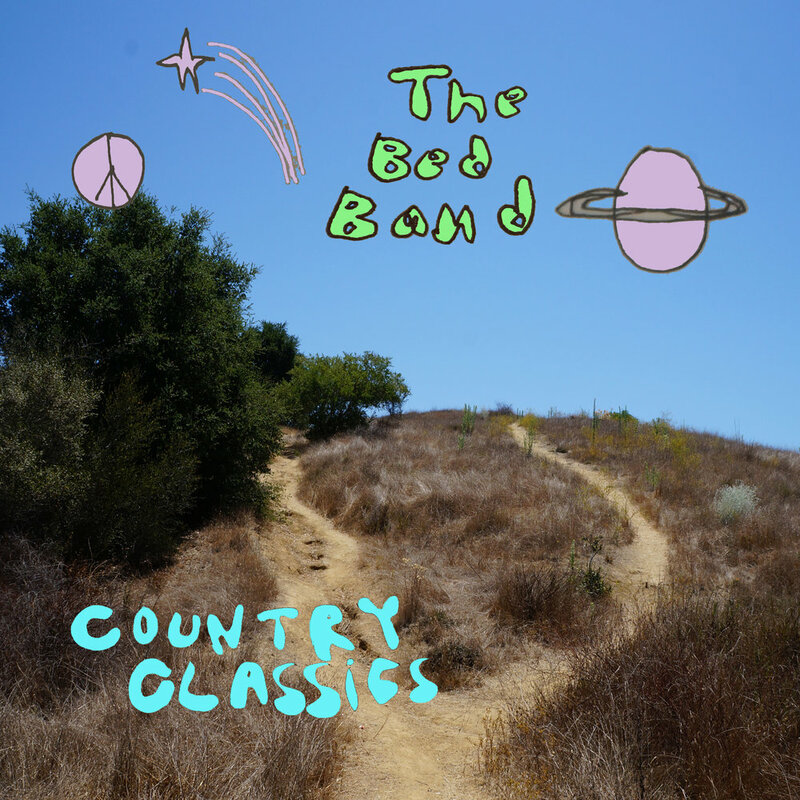 Right from the get go Cult Classics by The Bed Band is an improvement from the six albums that have been released since 2015. Pianos and keyboards appear more frequently then on other albums, as well as an array of percussion that helps set the mood of the occult which is further perpetuated by the lyrical subject matter. While the production is only slightly less melted than on previous releases, the majority of the album lacks the instrumental indulgence and prolific solos as seen in other areas of the bands discography, and rather focuses on carrying the infections melodies of the ten songs featured. The album clocks in at 29 minutes making it a quick study in The Bed Band’s seemingly endless pool of material, and an interesting take on todays current offerings in the filed of rock n’ roll. Though the album mostly stays true to The Bed Band’s ethos of never ending songs, half baked story lines, sloppy guitar solos, deadpan vocal delivery and an endearing DIY approach, it’s difficult to tell if the restraint and focus of Cult Classics is a refreshing moment of clarity for the band, or a misplaced effort at achieving a more accessible sound. Either way, under the hiss and jarble of the cassette tapes, the inconsistent drum machine bursts, meandering guitar riffs, and the wondering bass lines, The Bed Band is crafting songs and albums that are inching their way into the hearts and minds of rock n’ roll’s greatest admirers. Click on the album cover above to listen to the album! Another classic hit album by The Bed Band! Under my Blanket, The Bed Band’s fifth album, comes at a pivotal time for the band with a relocation of home base from Detroit MI, to Santa Fe NM. The Bed Band’s fifth album in barely three years, Under My Blanket explores a lot of familiar territory for The Bed Band, but sees them getting more comfortable with that territory, turning out songs that don’t sound far off from what I imagine holograms of The Rolling Stones playing demos underwater must sound like. ‘Walk the Walk’ and ‘Less is More’ are strait out of the early 70’s, ‘Colorado Springs’ harkens back to a simpler time, ‘Rain in the Desert’ sounds like the rantings of a washed up mystic, and ‘Not Cool’ might be the catchiest song of the bunch. ‘Phase Shift’ takes us through scouting guitar solos, while ‘Down’ ‘All is Holy’ and ‘A Lizard Stare’ show us a softer, more striped down approach. The Bed Band’s Under my Blanket succeeds in continuing the prolific pace of home recordings from the group. While it’s difficult to draw conclusions on the quality of the recordings, The song writing itself maintains an integrity undeniable to diehard fans of classic rock and home recording, as well as admires of the craft of songwriting. Click on the album cover above to listen to the album! Out now iTunes, Apple Music, Spotify, Amazon, Google Play, and more! a full album cover of The Rise and Fall of Ziggy Stardust and The Spiders From Mars by David Bowie, performed by The Bed Band. In honor of one of our greatest heroes David Bowie! WooW! Incense and Rainbows is the forth album by The Bed Band and is comprised of songs written during the writing and recording sessions of The Dreamiest released earlier the same year.